Everyone loves Ferris. We've done Film Petit 6 times now, and if you are a fan, you know we don't always restrict ourselves to choosing super popular movies. But who doesn't love Ferris Bueller's Day Off? That person probably shouldn't be trusted. You know the story. Ferris fakes sick to get out of school, then schemes Cameron and Sloane out too. 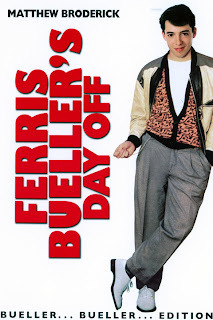 A day of shenanigans ensues while Ferris' jealous sister and doofus principal try to bust him. 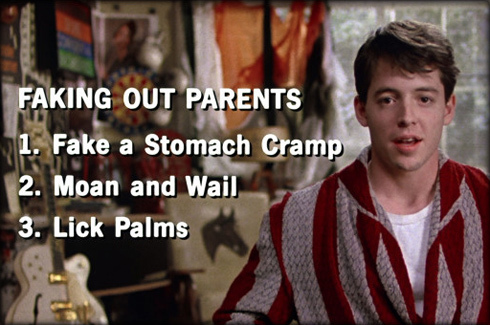 Is this the 80's greatest teenage trio of mischief? Undoubtedly. The conversation that Cameron and Sloane are having about life in the midst of all this is part of the genius that is a John Hughes movie: equal parts full-stop fun, teenage angst, and social commentary. You should probably relive the scene right now. 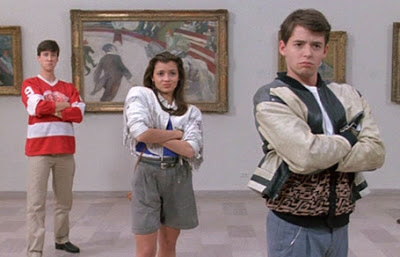 This time I knew I needed to copy Ferris' outfit pretty accurately. The pants are not gloriously pleated like his, but even with the more modern fit, I think it's pretty obvious who Hendrix is emulating here, wallet chain and all. They are the Oliver & S After School Pants in size 5. It's hard to tell from the pattern cover that they make great boy pants, but I saw a few pairs other people had made for boys and decided to try it. I love them. The fit is cool, but really relaxed so that he won't grow out of them too fast. I used a bottom weight gray cotton from Joann and they have a slight stretch, making them very comfy and easy for play. Or twisting and shouting. 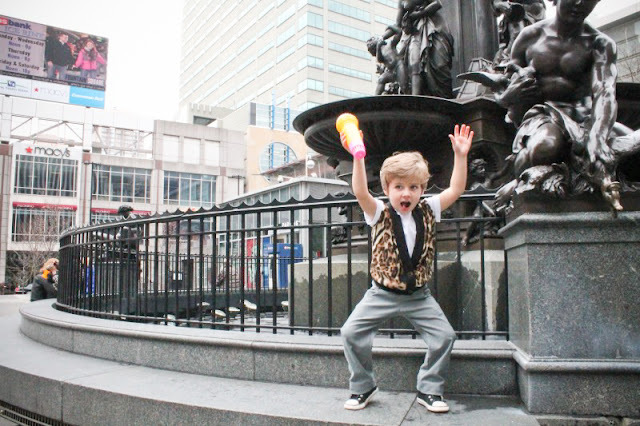 We took these photos at Fountain Square in downtown Cincinnati. (I did it all by myself this time, without dragging Nick into it!) People definitely knew what we were doing, but the why was probably a puzzler. Anyway, he did pretty good getting his twist on. 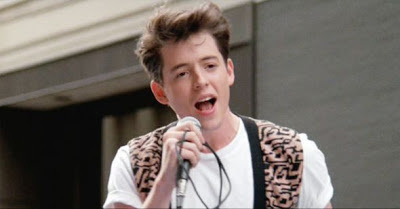 He is still singing the song and calling himself Ferris, or sometimes Berris. 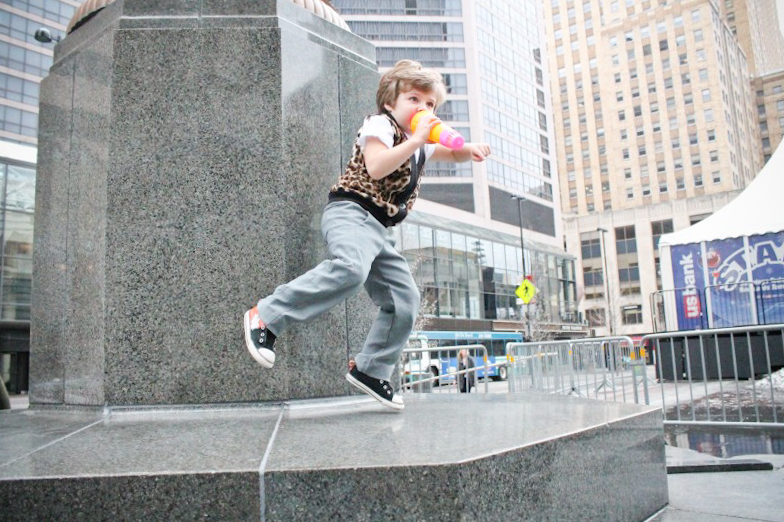 Now run fast to see Shannon's amazing little Sloane. Her mini fringe jacket is pretty much the cutest thing ever! We are so glad to have her and her super-talent playing along with us. 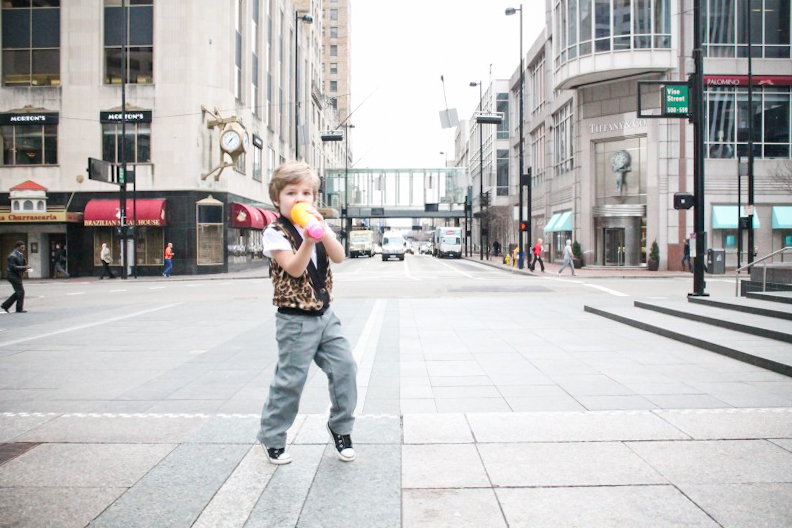 And of course, Cameron is very well represented by Kristin's little guy. Her stencil work is amazing and she took the cutest pictures in a museum. I love it! Can you imagine if we could have gotten all three of these kids pictured together in the museum? These are the weird things I dream about. 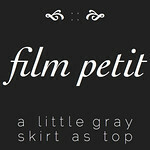 You can see all my past Film Petit posts right here. Last week I got to make a sweet baby gift for a friend (who was giving it to her friend.) It's been to long since I've gotten to sew for a baby! Well, besides that baby quilt I started. It's the free Snuggler Pattern by Lotta Jansdotter. I first one of these before Elsie was born, and then made a few more when a bunch of friends had babies at once. The first 3-4 weeks of Elsie's life I had totally forgot to use it. Then when I finally put her in it, it was like a miracle. She always napped like a pro, slept all the way through the night at 6 weeks, and never went back. These results probably aren't guaranteed for all babies, but I know this snuggled made a huge difference! Every new parent needs one. 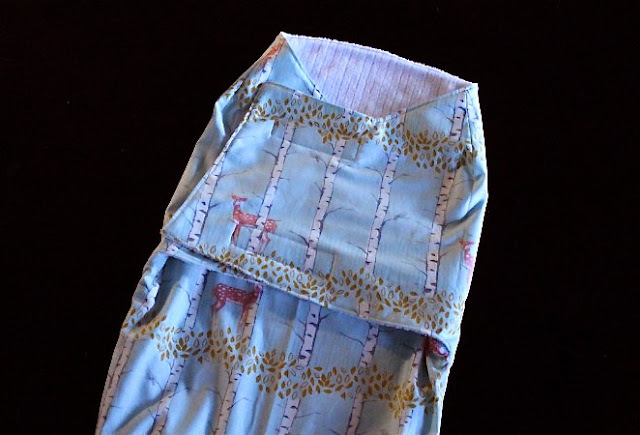 The fabric is from Sarah Watts' new Timber and Leaf line. It's just such a soft and beautiful woodsy group of fabrics. I wanted all of it, but kept myself to buying just two prints. 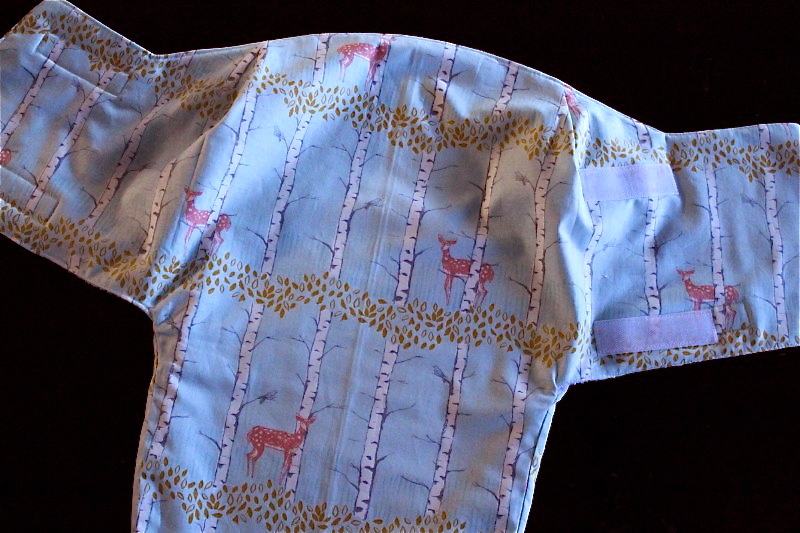 This particular mom loved the fabric because she had already painted birch trees on the nursery wall. I had no idea! Call me the fabric psychic. 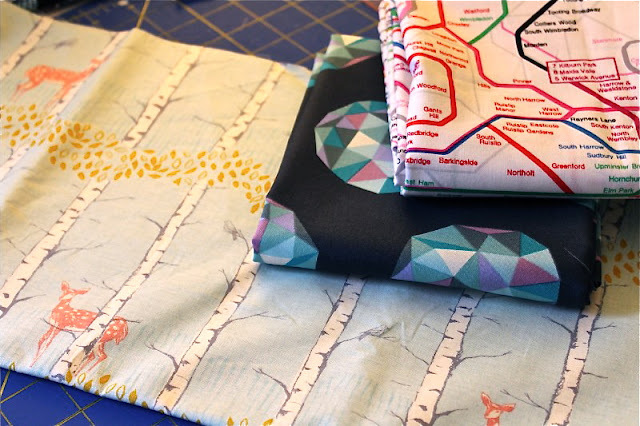 Which I did on a recent shopping trip to Fabric Shack with some new and old friends. 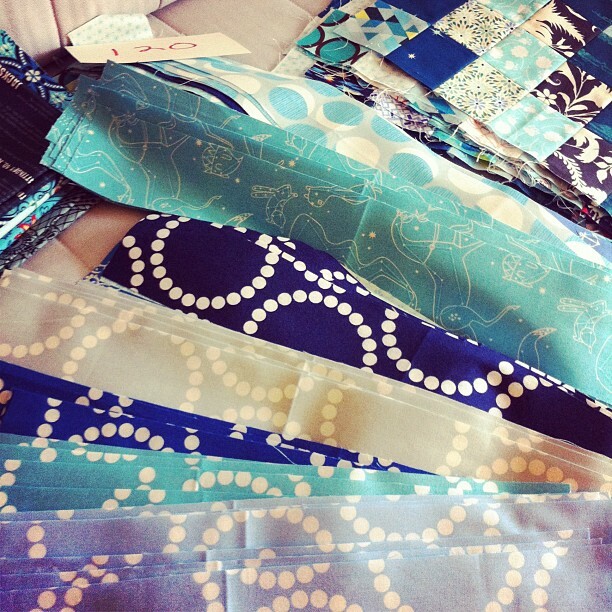 Fabric Shack is a great local quilt shop in the tiny town of Waynesville, OH, which is about 45 north of where I live. Everyone around here always talks about it, but I've never been. It's hard to be motivated to make that kind of trek to a fabric store when you are lucky enough to work in the best shop in the area. But I was pleasantly surprised by how much the selection lived up to everyone's talk. It's just a BIG little lqs, with room for lots of collections. Tons of modern designers, kona solids, Kaffe shot cottons, traditional stuff like repros and batiks, and even an extensive selection of novelties. That's where I found that super cool London subway print by Timeless Treasures that I couldn't resist. I also failed to resist some Tula Pink and Lizzy House. Before we got to the shop, I told Heather I wasn't looking to buy anything. Whoops. I should've known myself better than that. But even better than the fabric shopping was the time with great sewing friends. 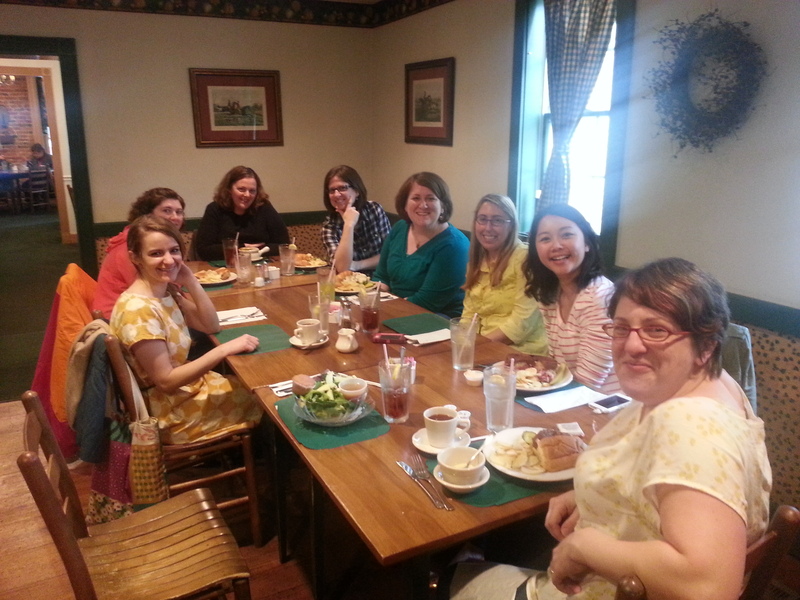 A group of IG/ blog friends from Columbus came down and met some of us Cincy girls for lunch and shopping. It was so fun to meet these sewists I've admired from afar for the first time! From left is April, Julie (my boss at Sewn), Heather, me (I don't know what I'm doing. I was completely unable to take a non-goofy picture that day), Kara (I stole this picture from you girl! ), Allie, Amanda, and Rachael. And Emily was there too, taking this picture. It was super fun to meet her since I started reading her blog ages ago. She was just as cool as I thought she'd be. I love when the internet comes to life and you think it might be weird, but instead it's normal and nice and mostly hilarious. Hopefully we can all hang again soon! 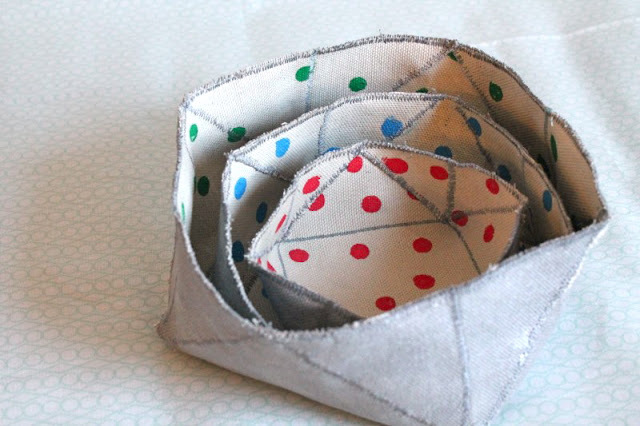 Have you heard of the book Improv Sewing by Nicole Blum and Debra Immergut? I love the idea behind it. There are a ton of projects (101!) in all categories of sewing that let you take creative control. 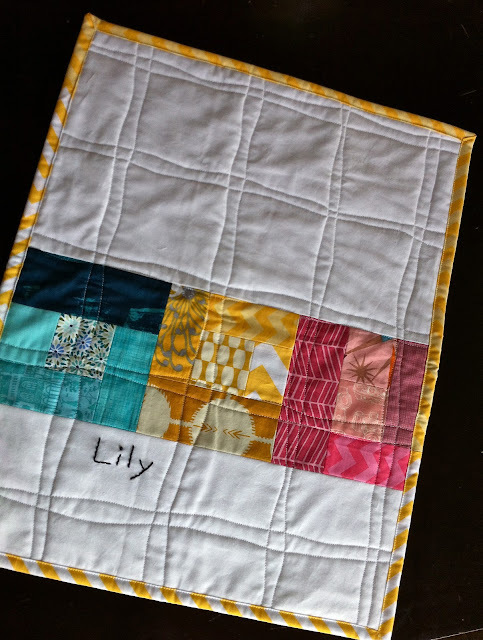 It's a little less about following the instructions right down to the letter, and more about learning just how creative you can get with your sewing machine. Sounds fun right? And don't worry, if you are a person who prefers following the directions to the tee, all the info you need is there. My friend and coworker Rachael is hosting a sew along through the book, casually covering one project per month. She's been gathering some really great prizes for the participants too. I started with three pieces of plain canvas...one might even say blank canvas... which made me think of painting, so I went digging around the craft bin to see what colors of acrylics I had. I was very happy to find metallic silver! So gussy. So I painted the outside in the silver and added polka dots to the other sides using pencil erasers as my stamps. Now I really really want to try that on some pants for the kids or something. I did all the painting and let it dry before sewing of course. I was slightly worried it might be bad news to sew on all that paint, but it was fine. However, my bobbin shuttle was very sparkly when I cleaned it out afterward. The book has you stitch more brightly colored lines across the whole piece before you stitch the corners up for added structure. But I found that the dried paint made the canvas extra sturdy and I didn't need to. This let me keep the dots uninterrupted. This was such a fun and satisfying little project! It uses such a small amount of fabric- all your need is about 1/3 yard cut of canvas. It would also be fun to try it with brighter colors of duck cloth and contrasting threads. I'm mostly glad it reminded me that I should probably think of more excuses to paint on random things! 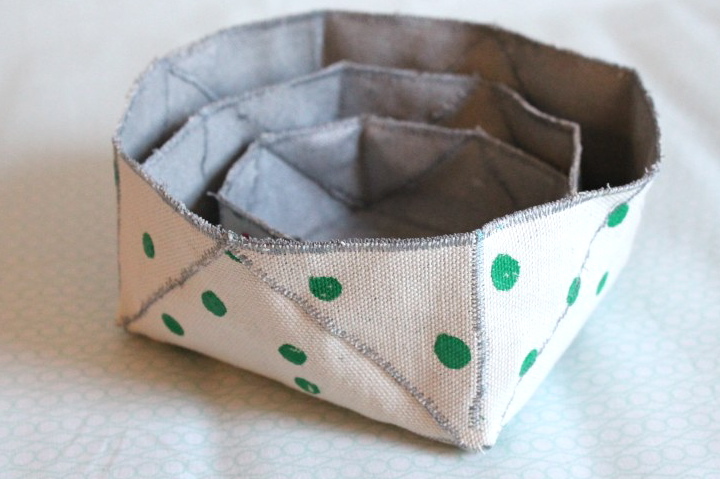 Are you inspired to stitch up your own canvas nesting boxes?? 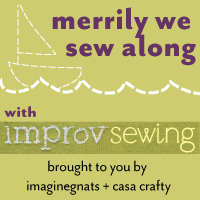 we would love for you to sew along with us (merrily, even). 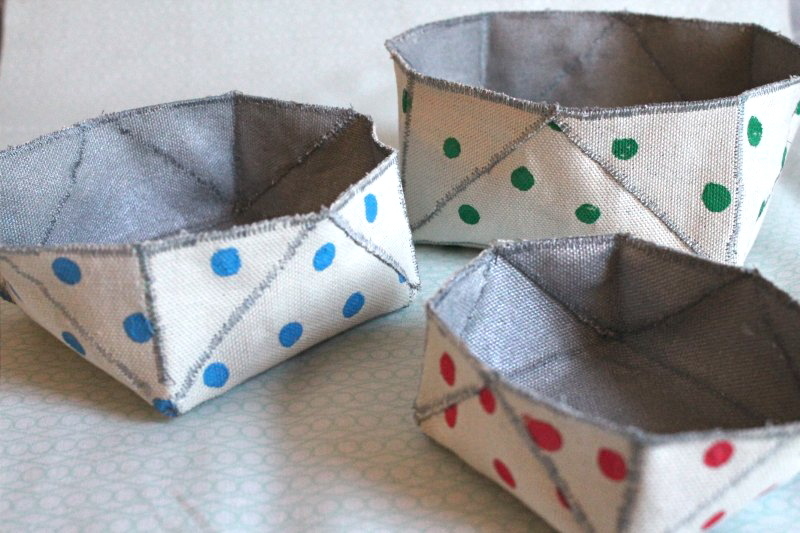 ... you should definitely check out the boxes made by the sew along co-hosts. They are all so different! Make your own a set of canvas nesting boxes and share a picture in the merrily we sew along flickr group for a chance to win a super fabulous prize!! 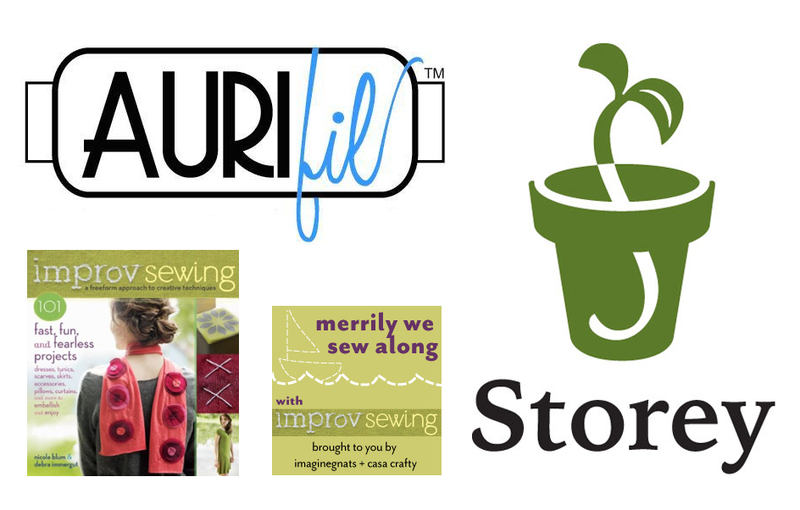 speaking of prizes, episode three: canvas nesting baskets is sponsored by the very wonderful Aurifil Thread and Storey Publishing! the winner of the merrily we sew along episode one challenge will receive a Folk Art Aurifil 12wt wool 12 spool large collection case, as well as a package of these five sewing books from Storey Publishing: Improv Sewing, One-Yard Wonders Fabric by Fabric, Mend It Better, Grow Your Handmade Busniess, and Sew Up a Home Makeover. how great is that?? so get improv-ing... i can't wait to see what you stitch up! 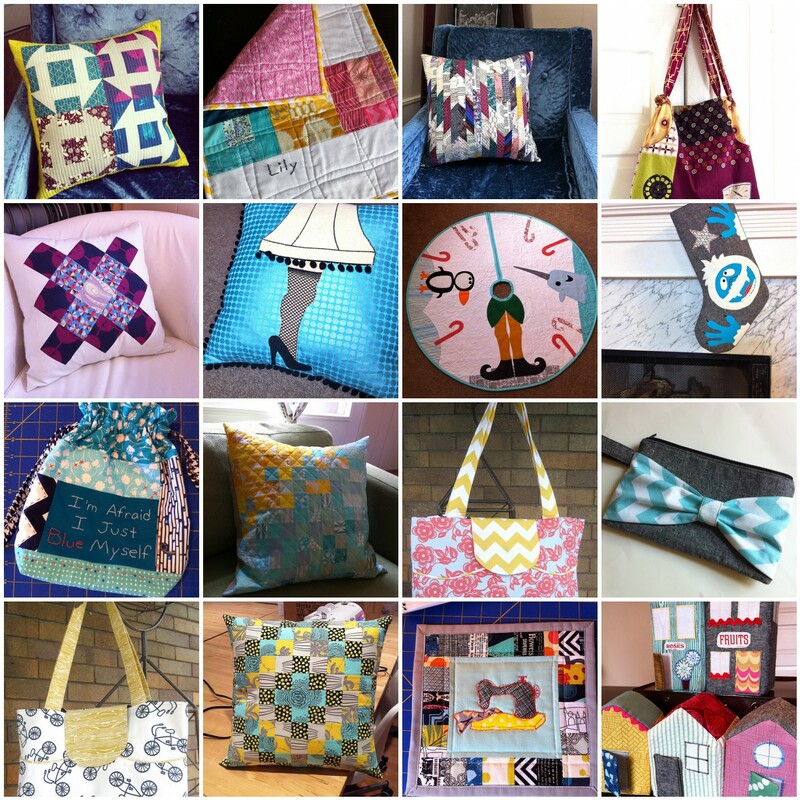 just upload a picture of your canvas nesting boxes to the merrily we sew along flickr group by february 28 to be entered to win!! Yes, I'm doing this too. I almost feel guilty and weak about it, because at first I swore I wouldn't succumb to the craze. 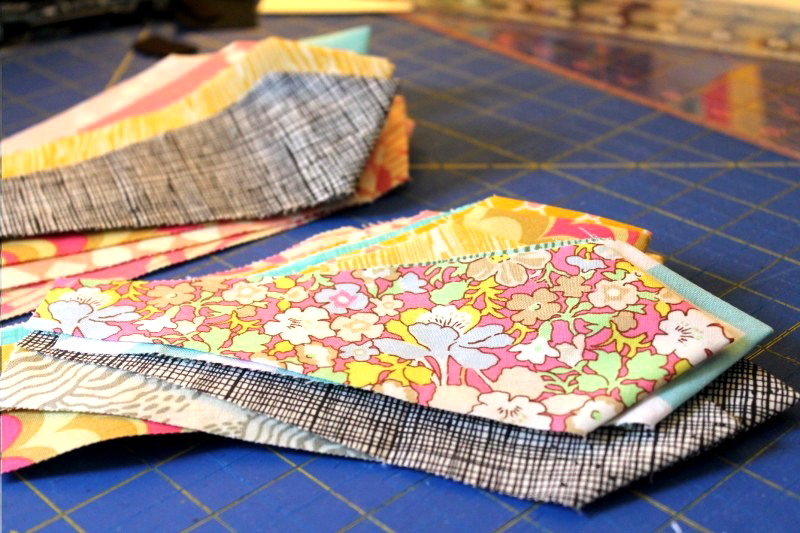 Then one day, without putting in much thought, I just grabbed my entire stash of blue fat quarters and began cutting them up in order to join in the #scrappytripalong that started spontaneously on instagram. It's fast and fun and satisfying each and every time a block is finished. It's based on this great tutorial. 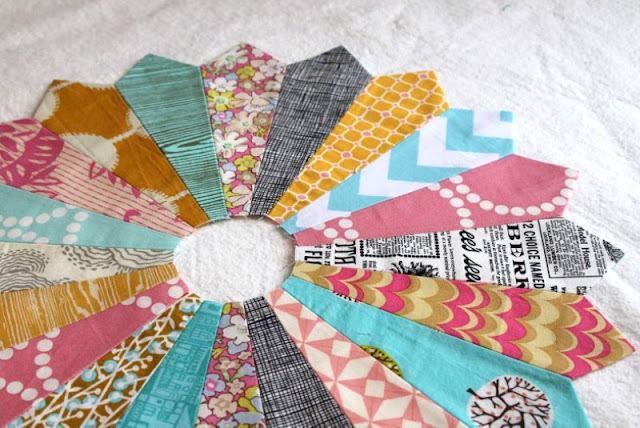 However, it's not so fast if you decide to make 56 of them for a queen sized quilt. I'm now halfway there, with 28 blocks done. The top picture is my first 16, but after that my Lizzy House Pearl Bracelets arrived and all the blue ones were immediately cut up, along with some blues from her Constellations line, which I got at Sewn Studio. I'm loving the blocks even more with all those mixed in now. I also wanted to let you know that if you're a newer quilter in the Cincinnati area, I'm teaching a class on this block on Saturday February 9th at Sewn Studio. Check out their site and call the shop for more info. Today I'm talking about embellishing a basic. For the past few months I've been kind of fixated on hand embroidering designs onto knits. It's not something I ever would have taken the time to do when I first started making my kids' clothing, but now I visualize stitches on everything. And when it comes to stitching onto stretchy knits, it's not as problematic as you would think. 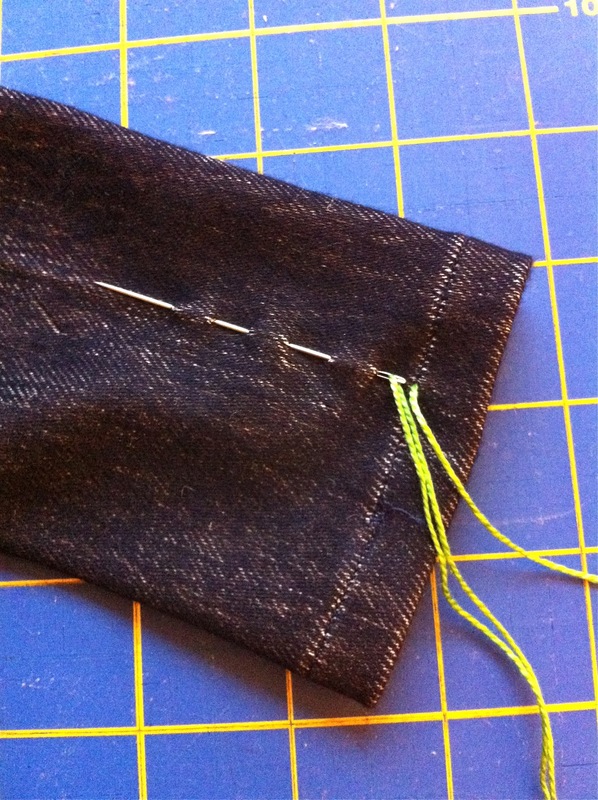 All you have to do is be careful not to stretch too much as you stitch. Leggings are kind of the ultimate knit basic for girls this time of year. I wish I had 3 dozen varieties of them for my daughter Elsie, all hanging in the closet on one of those automated tie racks. I made this pair using the Go To Leggings pattern, which was so great and has some wonderful options and tips for knits. I so enjoyed this pattern and will use it for years, I'm sure. 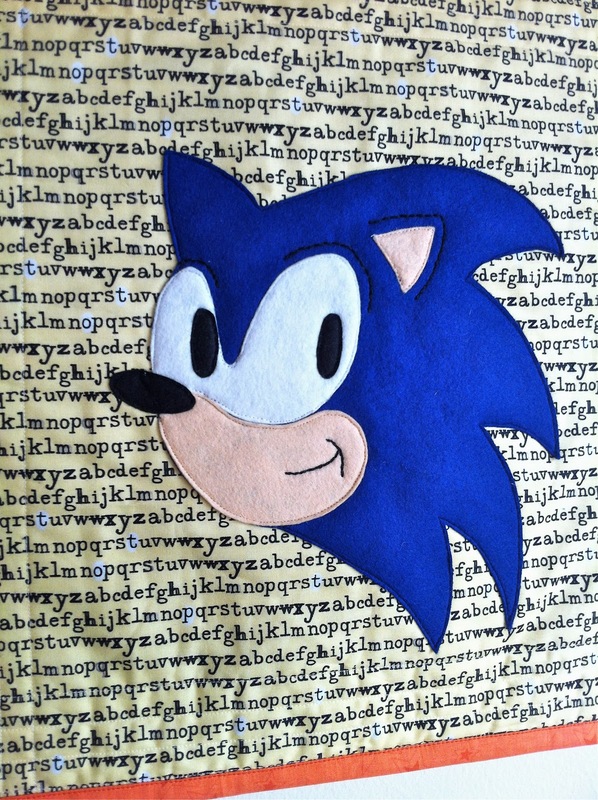 The hand stitching was really not as time intensive as you might think, and the small detail adds big appeal. First let's talk about the supplies. 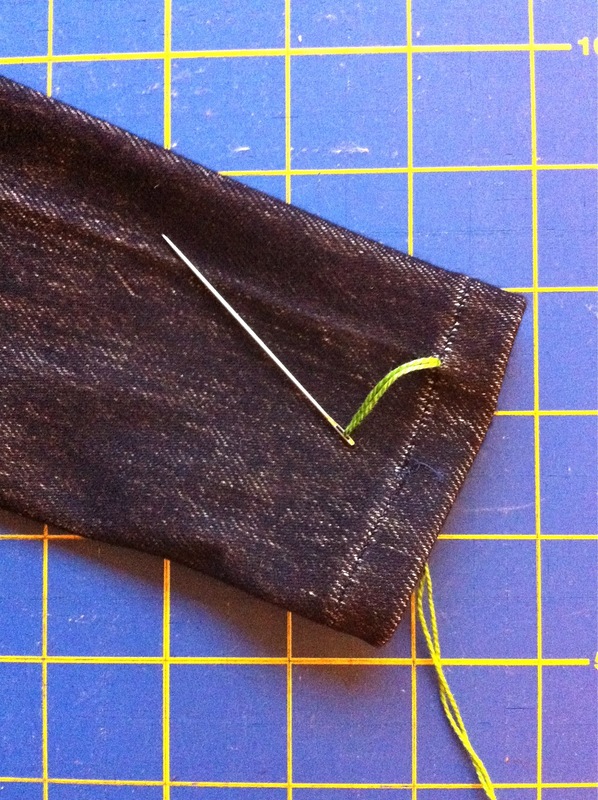 You will need a hand stitching needle with a large eye, like pebble or tapestry needles. 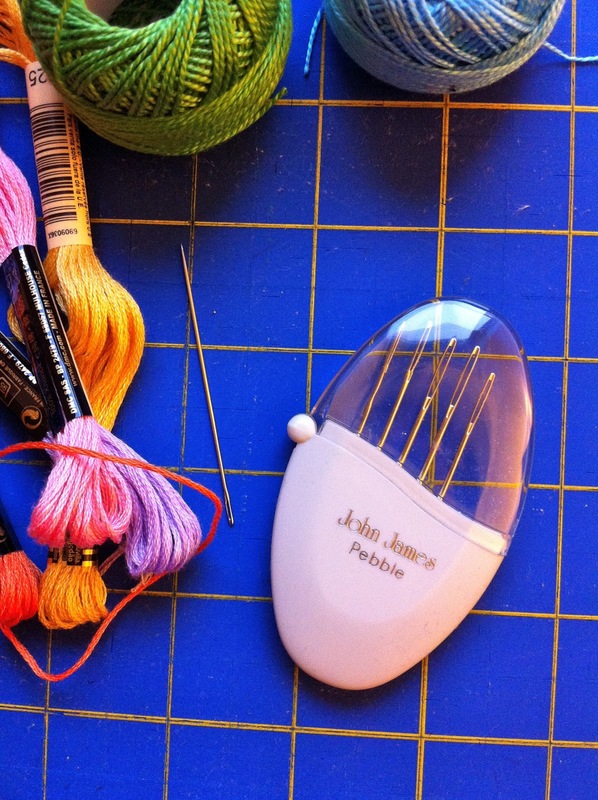 You can use regular embroidery floss or perle cotton. These are inexpensive and fairly easy to find. I've been growing my small collection of thread colors and now I usually have what I need on hand. My little rainbow consists of pink, orange, yellow, green, blue, and purple. Put your legging pieces together and hem the bottoms. Do not put the elastic waistband in yet. 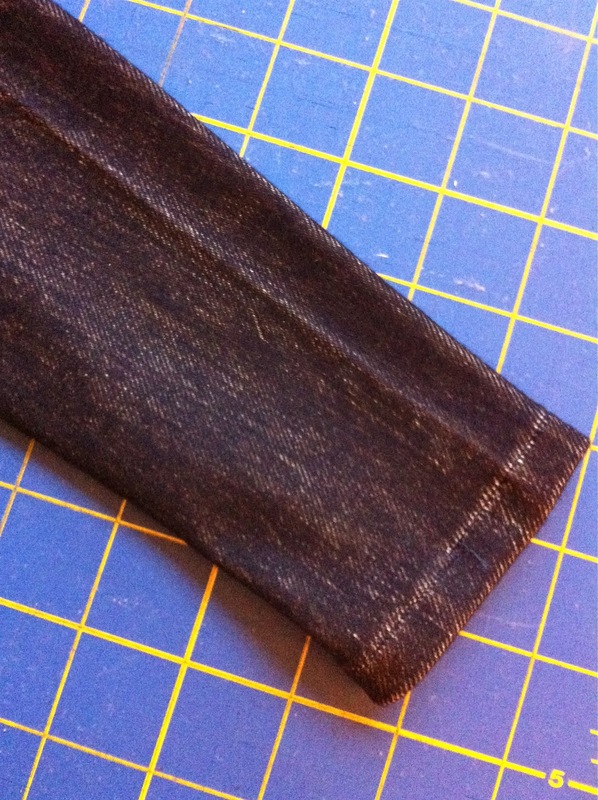 Press a nice crease into the sides of the legs. Thread your needle and knot the end of the thread. Starting where the crease meets the stitch line on the hem, bring your needle up through the wrong side. I began with green because that's in the middle of my rainbow. Go back into the fabric about 1/4' up and go in and out a couple more times before pulling the needle all the way through. 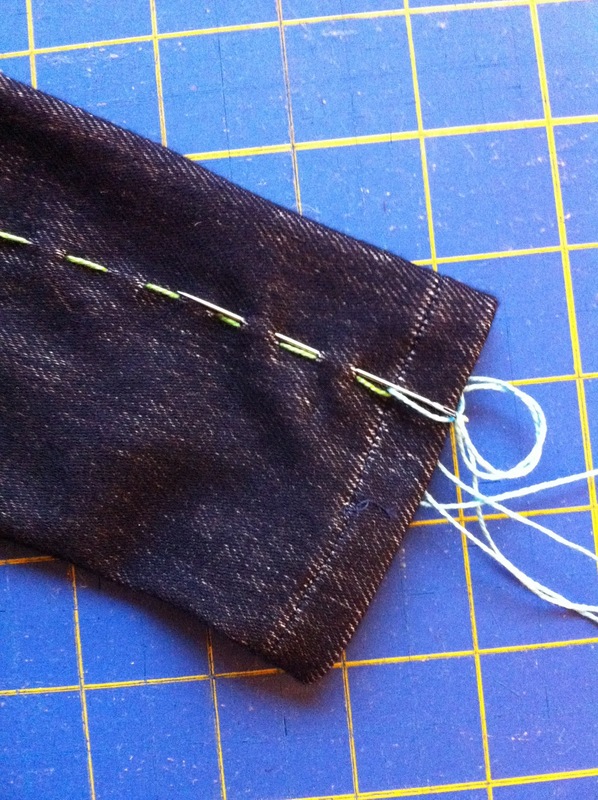 This is called a running stitch and it goes pretty fast because you can do a few at a time like this. Just make sure you are only going through one layer of your pants! Here is what it looks like after you pull the needle through. I use fairly large 1/4" stitches here so that they are more visible on the pants. Continue until you reach about 1.5" from the top. Tie it off on the wrong side with a knot. 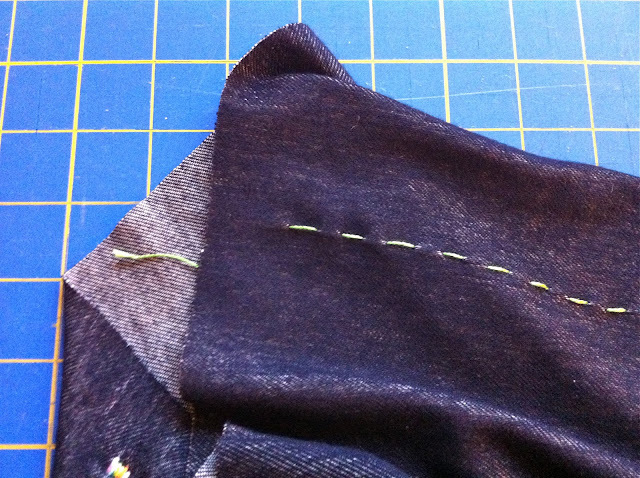 Start with your next color and use your first line of stitching as a guide to where the needle goes in and out. I did the blue and then purple on the front side, then went back from the green with yellow, orange, and pink. And since I know you are going to ask, that super cute blazer is from Target, I didn't make it. But I'd love to try making this pattern with a knit. Now you can head over to check out the (Whoa, infinitely more talented than me, wtf?) super lovely Lladybird for something a little more grown up. Not that grown ups can't wear jeggings with rainbows stitched up the sides, they totally can. And should. One thing I want to do on the blog this year is show more of the process. Take things slower, make the time to show the unfinished and the small decisions along the way. I always like reading those kinds of posts when other people do them, but I guess I never think to take the time unless I have something shiny and finished to show. But the truth is, unfinished is much more true to my life and has much greater potential. So this what I've started this week. 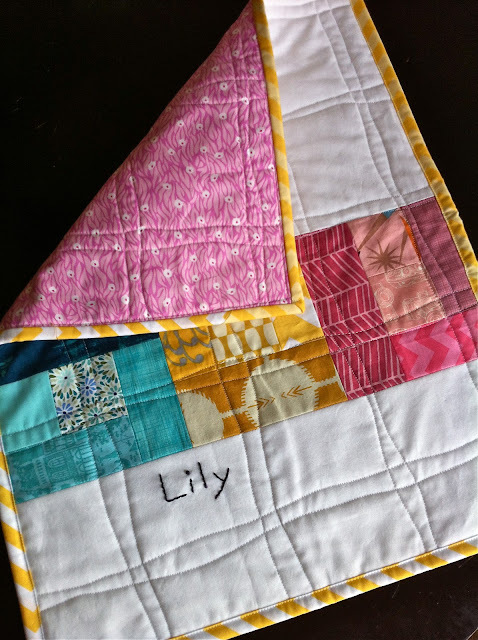 A new quilt for a very old friend who is having her first baby. 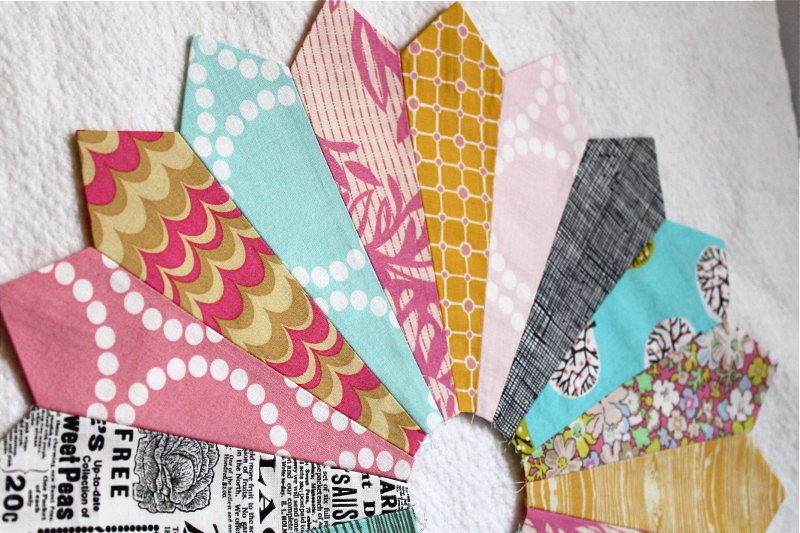 I started with sweet pinks and aquas and golds, then added a couple black/white and gray prints for an unexpected edge. I used almost entirely scraps, but also cut into a couple of fq's from my new bundle of Lizzy House's Pearl Bracelets. They just make everything better. Everything. 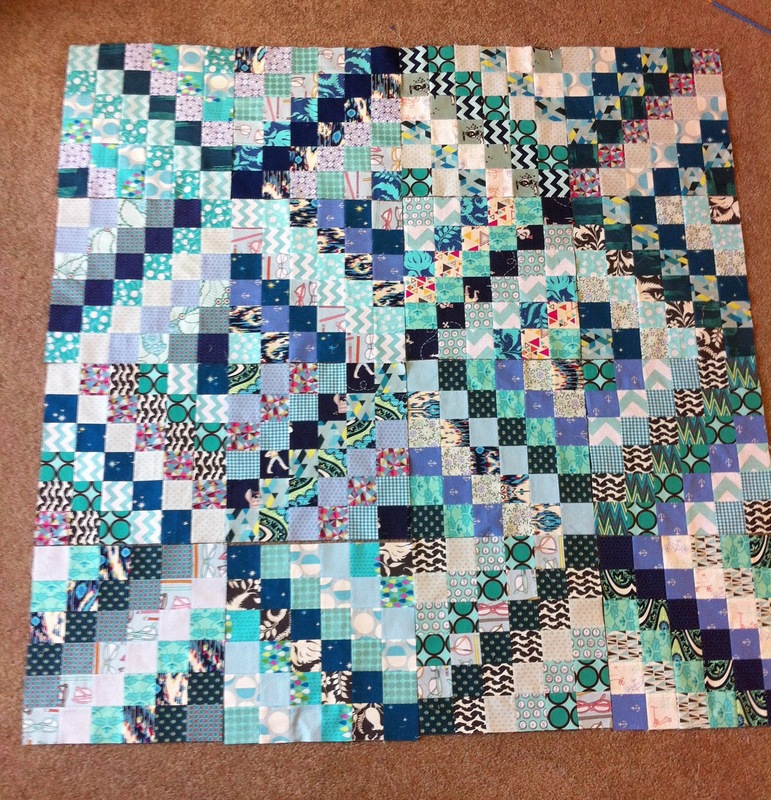 The quilt will be about 45" square and have four large dresdens. I have 2 done and 2 more sitting in these very appealing stacks. They are screaming at me to finish them. 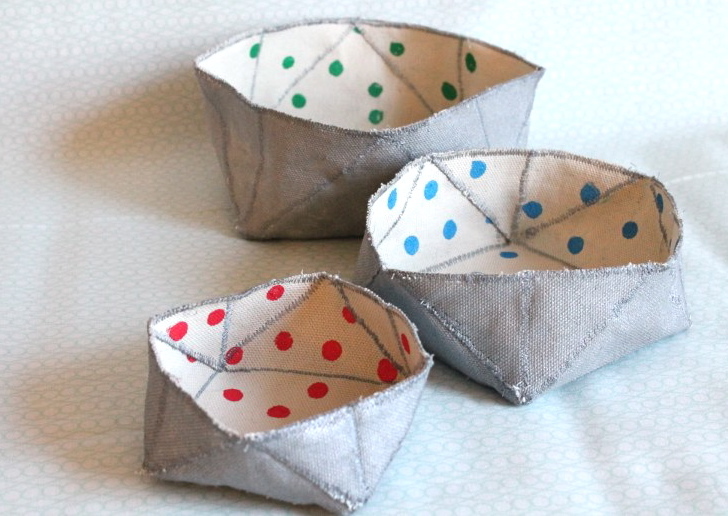 Tomorrow I'll take one of the finished ones into work and pick out a background, a backing and binding. As one would expect, it's very convenient to work in a fabric shop for many reasons. We have a couple new low-volume prints in that might be just the thing for the background. The colors would have to be just so to work with these, so we'll see if I end up defaulting to white. Maybe a very pale pink if I go the solid route? More of that floral Liberty print might be really nice for binding. Can't wait to show you the finished product! I learned a lot in 2012. Putting it together here is satisfying and a little nostalgic- is it possible to be nostalgic about things that are relatively recent? The nostalgic part comes when I think about competing in Project Run & Play in the spring. It was one of those things that was good for me in every unexpected way, but I'd never want to go through again. Winning was a very happy surprise, but definitely not the best one. I gained so much more just from having the excuse to push myself creatively and focus my mind that completely on the task. And I got the chance to learn how many cheerleaders I have. Really really good ones. The bottom half of the mosaic above is all the looks I've made for Film Petit with Kristin (Who turned out to be another fantastic surprise resulting from my PR&P experience.) I love doing those movie-inspired looks each month. We have more fun with those than should be allowed. There are no plans to stop them any time soon. 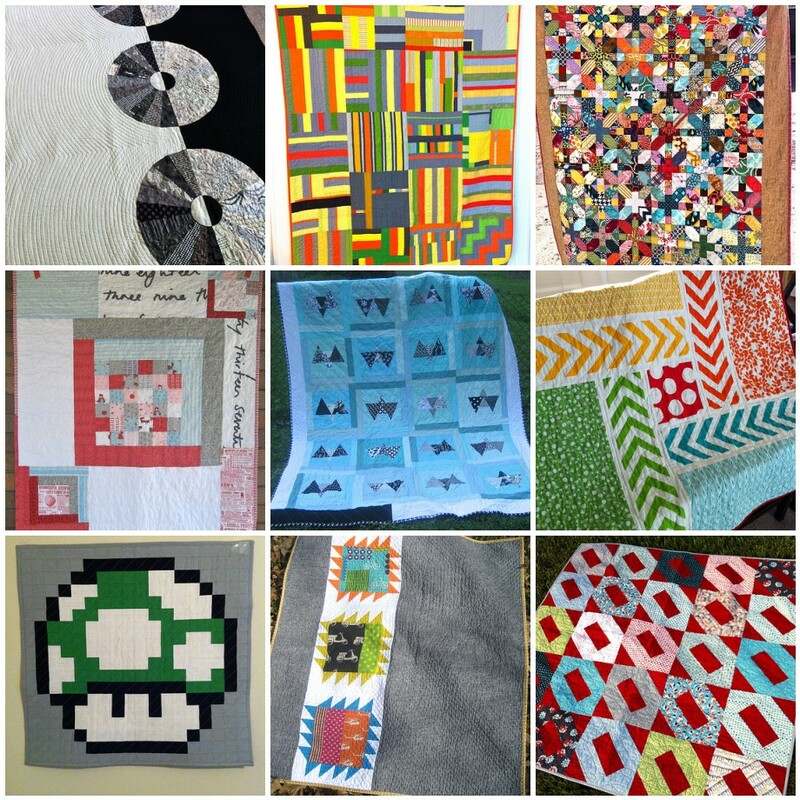 I finished 9 quilts this year. Three went to charity, three were gifts, one was my own pattern for Sewn Studio, one was for display in a big quilt show, and one was just for ME. I want a lot more of this in 2013. More quilts in each of those categories please. And here are just some of the smaller items I made. I'm a little hooked on gifting quilted pillows at the moment. I need to make more for my own couch this year. There were a lot of other clothing items I made for my kids this year that aren't shown here. After PR&P I was suddenly "known" in the tiny world of kid clothes bloggers and I did a gajillion guest posts and blog events. It was fun, but sometimes stressful. As I think about what I want this year to look like, well, I don't want that. I'm not trying to complain or sound ungrateful to anyone who had me participate in their awesome events. I just don't feel the need to say yes all the time anymore. I'm not a person that likes to be overly busy. Some people do really well at that kind of thing, but I don't at all. I need to leave a lot of extra room in life. So that's what I'm gonna do this year. You will still see a couple of those events coming up, and I don't regret doing those. I'm just gonna stop now. 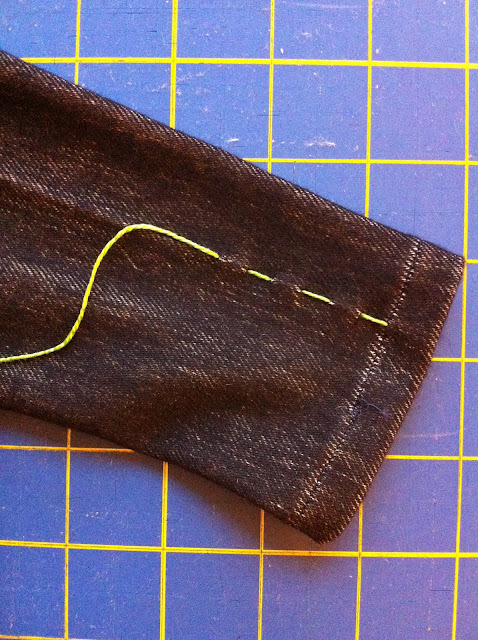 I'm just gonna sew what I want. So I guess if I were to do that hip thing where you choose one word to characterize your focus for the year, mine would be... SELFISH. 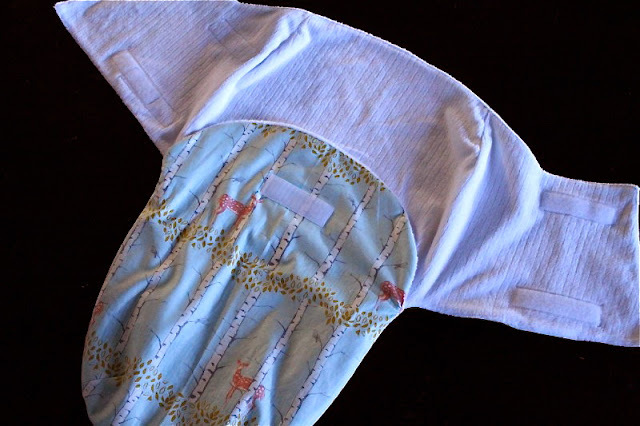 Today I'm at Sew Much Ado sharing some snippets and stories from my sewing past. Have you seen this series yet? It's been really fun to read thru everyone's posts and learn something a little more sentimental about all your favorite bloggers. Good stuff. 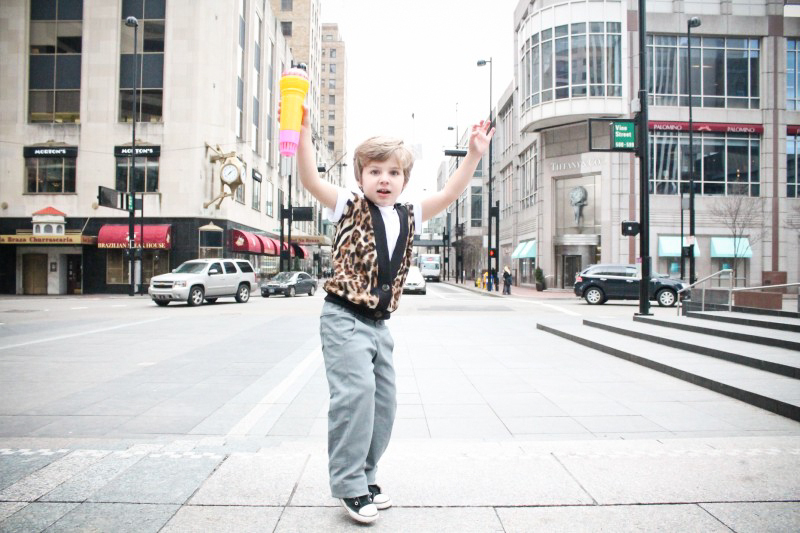 And for those in the Cincinnati area, I wanted to let you know that I'm teaching a 2-part class at Sewn Studio on January 17 and 24 on how to make the Oliver & S After School pants pattern. It's a great basic for boys and girls, and you'll learn some new skills. 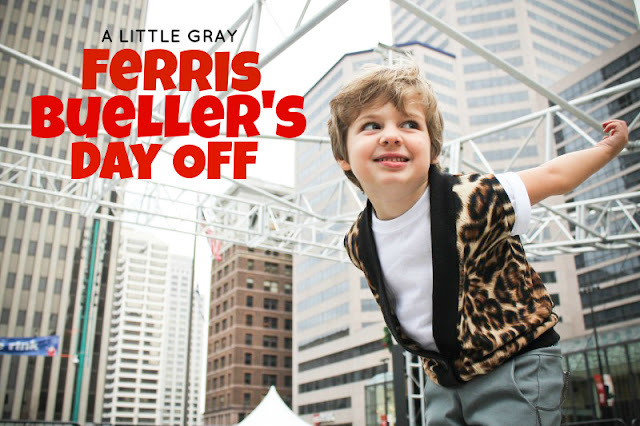 Call 513-321-0600 to sign up! Not that the gifts I made were particularly quick and/or dirty. Hopefully, none were dirty. But I figured I'd run them all down in one post today so we can all just move on with our lives already. Christmas, you are SO OVER right now. This one was actually a birthday gift for my mom. She turned 60 last week, and I turned 30! We had a really nice family celebration and she loved this pillow. Now I can't stop dreaming of a whole church dash quilt. This one is for their son Ryan. It's actually a 16" pillow cover, but I hadn't gotten the form yet when I took pictures. 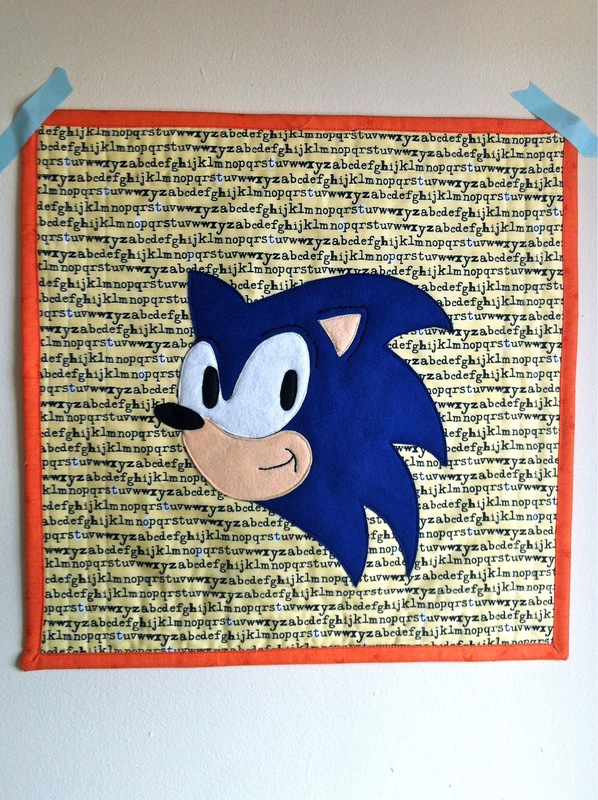 He LOVES Sonic. Which is kind of hilarious for a 5 year old in 2013. I love the way the felt appliqué looks on the Julia Rothman Type print I got at Sewn. I made four of these boxed-bottom zip pouches for Hendrix's teachers, but all I got was this late night IG pic of a couple of them. I really wanted to keep the triangle one for me. Lastly, an exciting gift for me! My mom got me a FQB of Lizzy House's Pearl Bracelets for my birthday. This is definitely my favorite print ever and I'm so excited to have every color. I've already used up 6-7 of them. 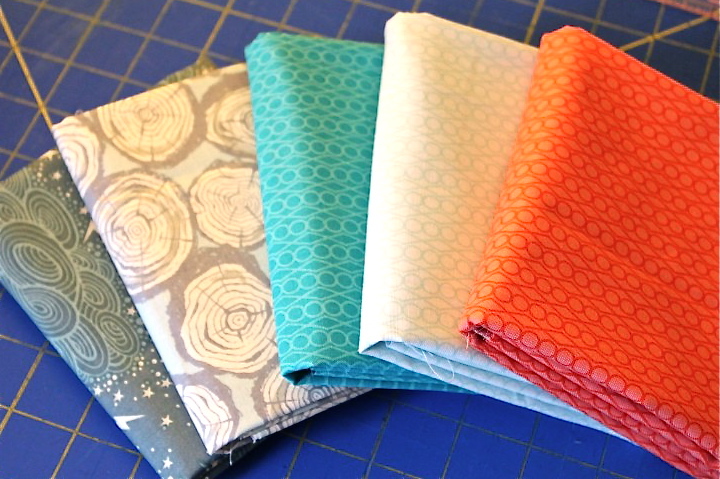 We found them still in stock at Fresh Modern Fabric, although I think they only have the half yard bundles now... which I might go back for soon!